The 2015 Nissan Pathfinder gives you the option to select 2WD, 4WD and Auto Mode so that you are confident that you are getting the best traction on the road during your travels, no matter whether the road is dry, wet, or even slippery. While you can rest assured that you are in an SUV with best-in-class safety features, your kids can sit comfy, cozy in the backseat watching their favorite DVDs in premium heated seats. Those road trips won’t seem so unbearable anymore! 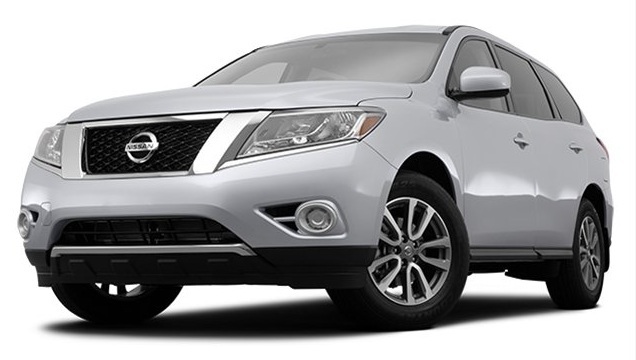 Stop into Carriage Nissan and take a 2015 Nissan Pathfinder for a drive today! Hook up whatever you need tow on the back of a Nissan Pathfinder and prepare to be blown away at how easily this SUV tows! With up to 5,000 lbs towing power, the 2015 Nissan Pathfinder comes with a 3.5-liter DOHC 24-valve V6 engine generating 260 horsepower and 240 lb-ft of torque. For such a large SUV with impressive power, this vehicle achieves up to 27 mpg highway / 20 mpg city*! Nothing is holding you back now from that trip to the lake or camping with the family! An SUV with all that power and superior performance has to have the best features to make it look good too. The 2015 Nissan Pathfinder comes standard with the following exterior features: 18-inch aluminum alloy wheels, front UV-reducing solar glass and rear privacy glass. On higher trim levels, you can find features such as: Smart Auto Headlights, fog lights, roof rails, a tow hitch receiver with 7-pin wiring harness, dual power heated outside mirrors, and a Dual Panorama moonroof. You are going to fall in love with the Pathfinders commanding, sleek, bold exterior! If the outside of a car can look this good, just imagine what the inside will be like! The 2015 Nissan Pathfinder comes standard with the following exterior features: Advanced Drive Assist® display, Push Button Ignition, remote keyless entry, Tri-Zone Automatic Temperature Control (ATC) with in-cabin microfilter, power door locks with auto-locking feature, power windows with driver’s one-touch auto-down, cruise control with steering wheel-mounted controls, overhead sunglass holder, cargo area under floor storage, EZ Flex® Seating System with 2nd row 60/40 split fold-flat bench seat featuring LATCH AND GLIDE® and 3rd-row 50/50 split fold-flat reclining bench seat, cloth seat trim, an AM/FM/CD audio system with in-dash 6-CD changer and 6 speakers, MP3/WMA CD playback capability, an auxiliary audio input jack, and illuminated steering wheel-mounted audio controls. And that’s just the standard features—imagine what else is available! Be sure to stop into Carriage Nissan and take the 2015 Nissan Pathfinder for a test drive today! With our large inventory, our team here at Carriage Nissan loves helping our customers find the perfect new car or used car for them! Please feel free to contact us if you have any questions or would like to schedule a test drive!